Steve Atkin (International Press Association) calls this new video/DVD an amazing insiders view on how George W. Bush walks the talk of his faith. and believes youll be deeply touched by this documentary. Produced by Grizzly Adams Productions, this non-political film documents the spiritual journey and life of the President and invites viewers to see how the power of faith can change a life, build a family and shape the destiny of a nation. He is the commander-in-chief of the worlds greatest superpower, the leader of the free world, the head of the executive branch of the U.S. governmentthe weight of responsibility is enormous, and it drives George W. Bush to his knees, in prayer and supplication. Like no other president in the history of our nation, Bush boldly, publicly, and genuinely loves out his faith on the job, say the producers, who ask viewers to decide for themselves whether President Bushs faith has been good for America. But whatever you decide, his faith will change and inspire you. DVD bonus features include: additional Bush insider interviews, Bush faith statements from speeches, historical faith documents, recommended reading list, and responses to Fahrenheit 9/11. 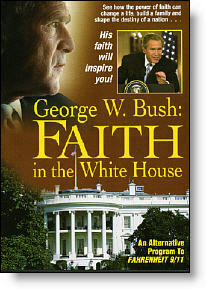 George W. Bush: Faith in the White House was broadcast on the DISH Network Pay-Per-View in November 2004. We were honored that out of all the recent films made abaout the President, DISH Network chose ours to make available to its viewers, said GAP Producer/Director David W. Balsiger. Balsiger says that the film was produced independent of the White House, the administration or other influence from the Bush-Cheney Election Campaign. Those opposed to Bush and media critics alike agree that this is the one must see full-length documentary on President Bush. “When it comes to objectivity and a balanced view between our Bush documentary and Moore’s show, there is a vast difference. Moores show has absolutely no spokesperson from the Bush Administration nor anyone else giving an opposing view to anything Moore says in the film. In contrast, ‘George W. Bush: Faith in the White House’ includes 18 proponent interviewees on Bush’s faith and comments from 10 anti-Bush spokespersons, whose perspectives tend to come from the liberal agenda,” explains Balsiger. Reportedly, the “George Bush…” documentary reached best-seller status on Amazon.com (#25 on Amazons Overall Best Sellers List of 9,000 DVDs. For more information, see grizzlyadams.tv. We will be reviewing this film for publication on Christian Spotlight.